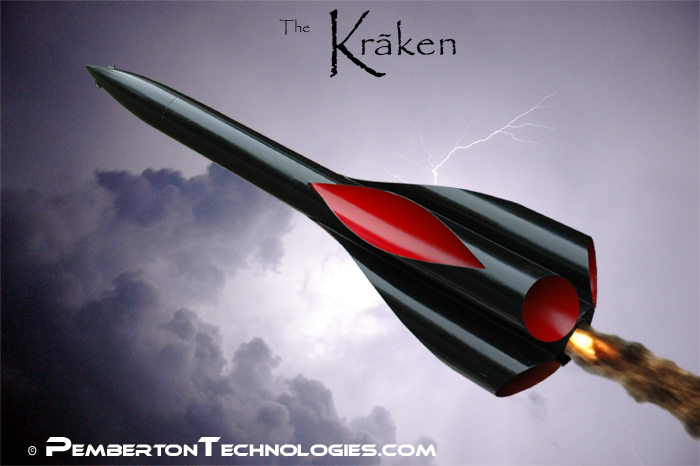 The Krãken (pronounced krã’-kin) is named after the dark and mysterious creature from the seagoing legends of yore. She is a sleek, black, shapely beauty, featuring our new and unique Sculpted Tube-Fin construction. Kit comes complete with balsa nose cone, nose canard pattern, balsa stock, two 18″ body tubes for tube fins and airframe, 15″ parachute, 60″ KEVLAR shock cord, precision cut centering rings, 24mm motor mount, launch lug and our infamous Destruction Manual. Recommended motors:D12, E9, D15, E15 and above, if you dare.